I am budget beating at the moment by choosing meat that is reasonably priced. I am not compromising on the quality of meat I am buying. I am merely spending my money wisely by getting what is on special. For today’s recipe, I used kiwi fruit to tenderize the meat. I went with ordinary stewing steak and selected pork as that is what was available at our local market. This would work perfectly well with beef and with venison. I have a juicer so it made using the kiwi fruit really easy. What amazed me when I juiced the kiwi fruit was how little waste there was. Usually I end up with a lot of pulp. I did not take the juicer out for just this recipe, so stay tuned for another recipe using kiwi fruit juice which will appear on the blog soon. This post is part of my entry into the Zespri® 14 Day Daily Scoop of Amazing Challenge. Wow they look awesome, steak in a wrap, never really tried that, thanks for sharing. I hear there is a new butchery that everyone is talking about locally – perhaps you have posted about it more recently? If I find out where it is I will let you know. I would be most interested to try a new butchery! Should we go on a fact finding mission? 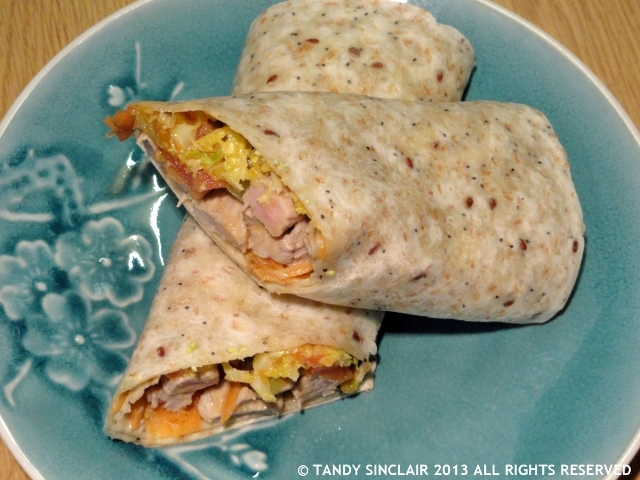 I do love wraps, and with pork, no less! Very clever use of the kiwi and another great use for those lovely tortilla wraps! And I have never heard of pork and oranges so I shall have to try that! I’ve never heard of using kiwi before to tenderise meat! Very interesting indeed, thanks for sharing. Very clever recipe, would never have thought of using kiwi juice as a tenderiser.